Amid all the bitchy responses to our Agency.com item from yesterday (our favorite: “Can we stop referring to this blog as ‘AdFreak’?”), someone suggested that the shop’s Subway pitch video is so bad it’s become good. Maybe so. Someone’s been inspired enough to make (presumably unofficial) T-shirts. 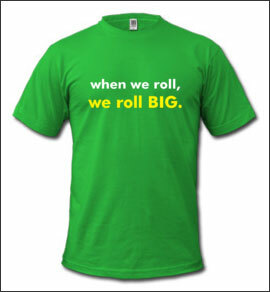 “When we roll, we roll big” has a certain panache, though the actual line is the slightly less robust “If we roll, we roll big.” On the back of the shirt, in smaller lettering, it reads, “Corner office, now,” which is also nice. They could do a whole line of shirts. Other possibilities, straight from the video: “Is that a 6-incher you’ve got there, or a 12-incher?” And the classic “Are you allowed to talk to women?” The shirts are going for $19.90 plus shipping. UPDATE: Also check out Jim Coudal’s homage video here. Funny stuff.